Just in case you still have some questions please check out these frequently asked questions. How old/tall do you have to be to take a ride in a shpere? The single rider weight limit is 250 lbs. and the combined rider weight limit is 480 lbs. Can my friends and family come to watch and take pictures/video? Is there a facility for me to change my clothing? Do you sell Spheres to the general public? YES, 2015 is our first year in sales of the only safe and insurable downhill zorbing equipment. For more information visit our Freeballin Store and/or give us a call/email and lets get rolling contact us. Are consents required for persons under 18 years old? Yes - if under 18 years of age a parent or guardian must complete a waiver in order for you to participate in our zorbing activities. If particpating in a group activity (such as a school event) a group supervisor over the age of 21 may provide consent assuming he/she has been given authority by a legal guardian to do so. What else you got? If your pregnant, claustiphobic (tough one to spell), have any kind of physical, mental, or self inflicted ailment that may prevent you from safely enjoying the ride then we ask that you please refrain from Freeballin in the USA. 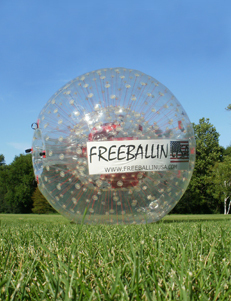 We ask that you go Freeballin only if your up for it, you know who you are..